My husband and six of our children just spent three blissfully nerdy days in Greenville, SC, at the Great Homeschool Convention. In the early years of our (currently) 21-year homeschooling journey, I attended conferences to hear the speakers; for the next few years I’d skip the speaking sessions in favor of the expo hall (those were the years I alternated between pushing a stroller and waddling along expecting our next addition); next I worked for vendors (Math-U-See and Quaver Music) and mostly stayed in a booth. Now I’ve come full circle: because we participate in a Classical Conversations community, I don’t have to analyze and agonize over what books we’ll use, but now I find myself hungry for the speaker sessions again. I’m no longer interested in beginner subjects—how to teach spelling or choose a co-op that’s right for you; honestly, I’m bored with homeschooling as a topic. But worldview? Teaching the classics? Shakespeare? Classical education? I’m all over that. The Great Homeschool Convention combines a rockstar lineup of speakers and sessions with a massive vendor hall and optional entertainment and speakers for an additional fee on Friday and Saturday nights. We attended An Evening with Dr. Ben Carson last night in a packed ballroom. His is a story to inspire children and adults alike. We streamed Gifted Hands: The Ben Carson Story from Netflix (a great family movie!) and bought the book for our oldest daughter for Christmas. I’ve recently adopted Dr. Carson’s mother’s plan of assigning extra reading and book reports to my youngest three kids. They looked a little surprised at first, but I think they’re enjoying it. He challenged us to spend 30 minutes a day learning something new. It’s easy to spend so much time teaching our children that we forget to teach ourselves. This is the first time our whole family attended a homeschool conference. 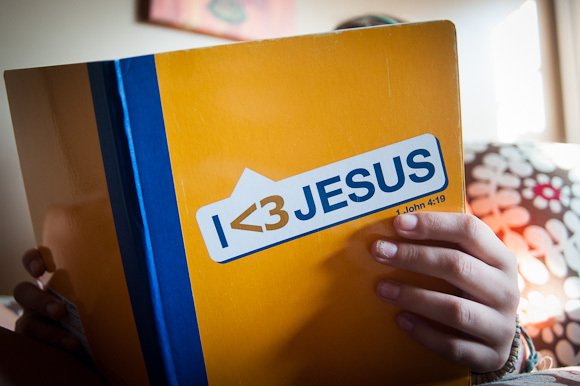 Someday my kids will quit analyzing other homeschoolers and just embrace them as their people. Yes, a lot of us are different, both parents and kids. Instead of denim jumpers, my bags held my latest Stitch Fix (review to come! ), not that I’ve seen a lot of denim jumpers lately anyway. Homeschooling has progressed beyond stereotypes. My 14, 17, and 19 year olds participated in the Teen Track, a series focusing on topics like moral relativism, creation science, and worldview. The Great Homeschool Convention sessions were so diverse and engaging that at times members of my family sat in as many as four different ones at once, based on our interests. No one said, “Seriously? We’re going to a homeschool conference as a vacation?” Everyone loved it, discovered new interests, and we learned both together and separately, as a family. If you can make it to a Great Homeschool Convention, I highly recommend it for either you or your whole family. 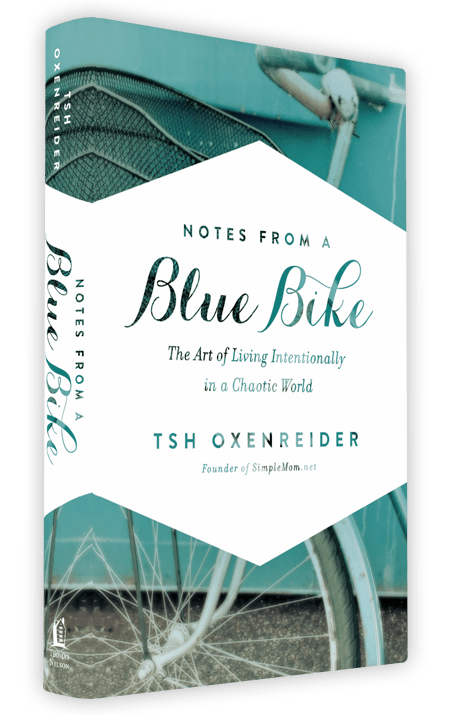 My friend Tsh Oxenreider releases a new book into the world this week, Notes from a Blue Bike: The Art of Living Intentionally in a Chaotic World . Today I join the Blue Bike Blog Tour to talk about the path we’ve chosen for our children’s education, one of the ways we’ve chosen to live more intentionally. 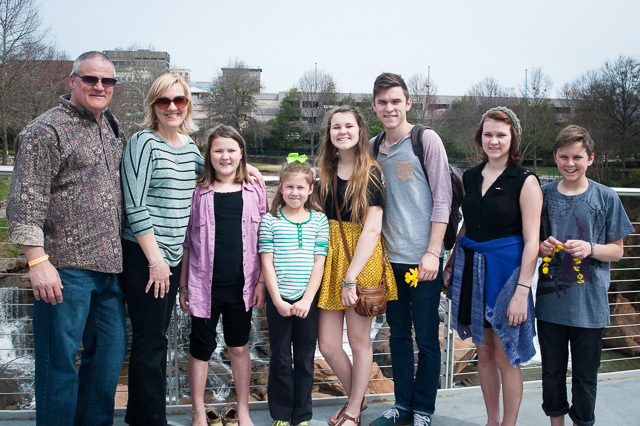 Our family began homeschooling in 1993, when our oldest entered second grade and we had a two year old. 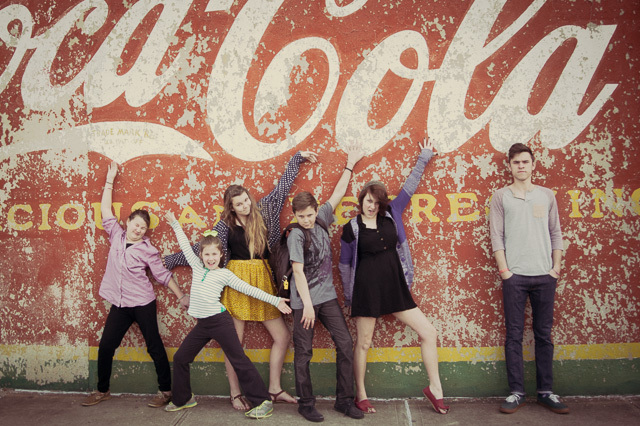 Because we spread the births of our 8 children over a 19-year period, we’ll homeschool for 30 consecutive years. It’s really no wonder I started burning out around year 13. Discovering Classical Conversations, or CC as we call it, energized me as a homeschooling parent and that translates into a better homeschool. For years I resisted options where someone else picked the books we’d read and the curriculum we’d use, but this classical education program incorporated what I would have chosen myself while saving me the work of lesson planning (not my favorite thing) in the process. Our family has experienced the full range of Classical Conversations, from a young 4 year old in the Foundations (elementary level) program to a Challenge IV (the oldest high school class) graduate, and everything in between. We’ve staked our ground in the broad landscape of homeschooling and we’re growing roots, because this program has deep ones. I teach a class called Challenge II (approximately 10th grade), with an emphasis on Western Cultural History. We study art, music, British literature, debate, biology, Latin, Algebra 2, logic, and American drama. Such good stuff. 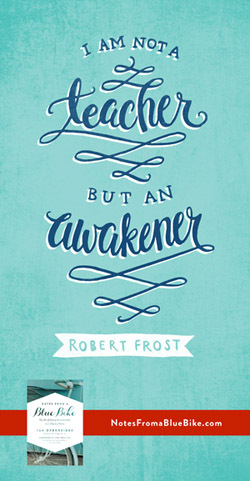 This is the education I wish I’d had; I’m thankful we found it for our kids. Notes from a Blue Bike is available in hardback online and at your local bookstore, or as an ebook download . You know those days when everything seems to go wrong and you just want to give up, sit down, and cry? Yeah, those days. I had one last week, but God sent me a moment of grace to put it in perspective. It felt like swimming in molasses, never slowing down but not accomplishing anything, either. Disrespect from the kids didn’t help. I sat down at the kitchen counter for phonics with one of my little girls and took a deep breath. Teaching a child to read requires patience; they learn at their own speed and sometimes it feels like a two steps forward/one step backwards process. This particular daughter struggles, still sounding out each letter most of the time. I recently pulled out our dogeared set of Pathway Readers. Learning words and sentences in a phonics book is necessary, but there’s a thrill to reading stories. Over the years I’ve seen how these little books can bless a struggling reader. As she reads the story, my daughter realizes that she can read whole words, putting them together all at once instead of sounding them out and building letter by letter. I feel her excitement build as she trembles, the words pouring out of her faster and faster. And then I start to cry as this moment of grace washes over me, removing the morning’s frustrations and discouragement and leaving me ever grateful for sweet mercies. 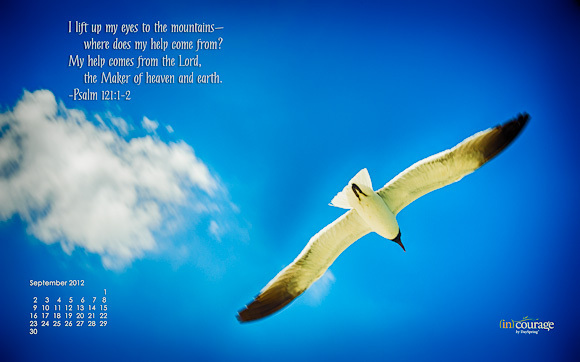 Isn’t it wonderful how the Lord sends us a ray of hope sometimes, just when we need it most? 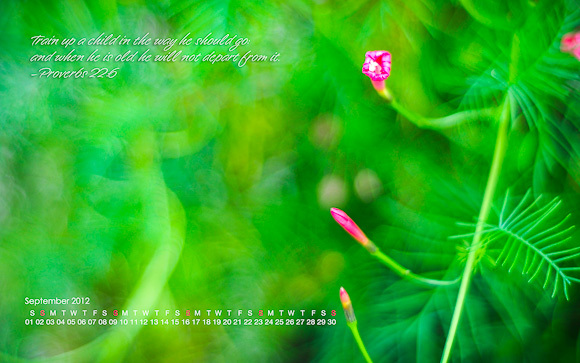 Decorate your desktop with your choice of two images this month! This soaring sea gull is available at (in)courage. And this swirly mass of green and pink goodness is available at The Homeschool Post, where a new awards season is about to begin. I’ve hosted the Inspired Deals page at (in)courage this month, featuring a selection of Back to School supplies from DaySpring and a new line of plush toys and cards called U-NEEKS (get it, unique?). In the latest post we’re giving away 10 Back to School sets! Just click over here and leave a comment on the post saying which set is your favorite. The winners will be announced Tuesday.